November is here and that is a favorite in itself! I am back in the swing of things though I can't claim to have made much headway on the blog to-do lists so I won't promise any consistency with the blog just yet as I need to complete the marketing course I purchased and am barely staying afloat with work demands and life. That being said you may notice some posts being shorter here and there. I'm linking up with Andrea today to share my recent faves. I can't get enough of these Leith racer back dresses that I've mentioned before. It continues to go in and out of stock in various colors and sizes on Nordstrom's site. I'm not sure why they haven't gotten the memo to stock up more or perhaps it's intentional to make us want it more...which, I do. I own it in three colors and would love to own it in a navy or other darker color for work. It's perfect with sandals, flats, wedges, heels, and as you can see below...boots! It's the most comfortable and versatile dress ever. It's definitely worth checking back for periodically. I wore this outfit to work one day and thankfully thought to take a picture of it when I got home before changing. All the pretty fall things. I've coveted this BP leopard print scarf for months. And, I mean months. I don't know why I didn't just buy it but there's a dozen things that have been waiting for me in my Nordstrom cart for a while now and I own a ton of scarves that I do not get to wear enough because of Houston's miserably warm winters. Well, recently I attempted to host a scarf exchange during a wine night/ double engagement celebration at my apartment and I ended up picking this gift bag randomly with the scarf! #winning And I say "attempted to host a scarf exchange" because some of the girls brought scarves and we placed the bags in a pile, drank a lot of wine, and forgot to have the actual exchange...oops! Some girls grabbed bags on the way out and the remaining ones were opened in the weeeee hours of the morning. Still fun! Over the knee boots for fall. I love them. I need more cold weather in my life to be able to wear them! We had a cold front come through (briefly) last weekend and it was glorious! I got to wear my OTK boots a couple of times and even some sweaters. It's the little things these days. 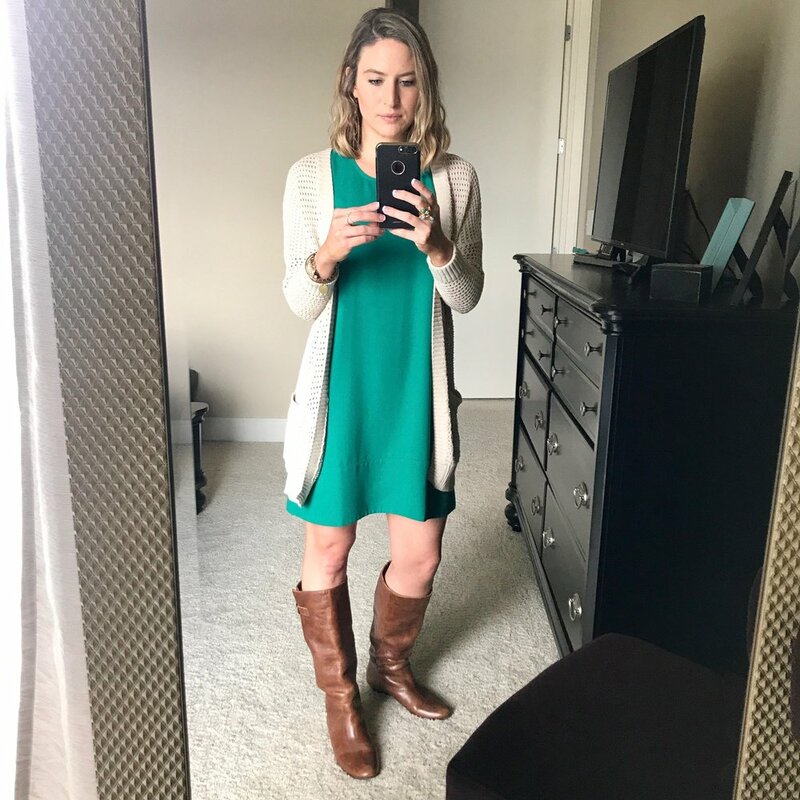 If you followed along with me at any point in the cooler months over the past year then you've probably seen many posts mention Denizen by Levi modern skinny jeans @ Target! They're still there, reasonably priced ($27), and super comfortable! Over the weekend I got the "on this day" reminder from Facebook about several posts I've shared on the same day over the past few years. Turns out I have an obvious affection for the study of love, marriage, and relationships the way they are intended to be per the bible. While some "on this day" reminders can conjure up other memories, these stand the test of time. I 100% feel the same about these as I did when I originally shared them. So good! I went out for a run on Monday to enjoy the remaining semi-cool weather before our temps reach the 80's again. I ran "off the beaten trail" along the former running trail that still hasn't been recovered since Hurricane Harvey. The city is making progress in stride around Buffalo Bayou Park and it's noticeable each time I go down there. This was the first I could get around on the lower running trails although much of it is still covered in silt. Some parts of it was like running on a beach, some parts of it I had to carefully climb through trees so that I didn't get near cracked/almost falling into the bayou cement paths. Then I came across this near the dog park that is no-where near being restored yet. Yep, that's a park bench still covered. Its a solid, in-your-face reminder that there was an additional 20+ feet of water rushing over the top of that bench for weeks. It's easy for life to resume when we weren't directly affected. But in reality our city has a ways to go to recover, as I am sure the same can be said for Florida, Puerto Rico, Mexico City, and all of the other Caribbean islands that were devastated recently. I paused at my normal sunrise spot to capture the essence of Buffalo Bayou right now. The sunset is behind me. With silt covering the banks and lacking green grass, the bayou's water levels are oddly lower than normal as well. Or maybe it's not and it just looks that way because of the silt? There are plenty of ducks in and along the banks/trails despite the remaining debris. The past weekend was great. We had dinner with another couple, I went ring shopping with/for a couple of my besties, I spent Saturday doing stuff with the BF, and the Sunday we hosting some of my family and his for a lunch of my pumpkin-butternut squash chili, hot dogs, pulled pork my aunt brought over, and this (very non-Paleo) banana pudding. I made it from scratch, the old fashioned way and it was a hit. At the end of the day there was none left! I wish I had take a pretty picture of it before serving it. The meringue on the top was a gorgeous toasted brown with crumbled vanilla wafers. This is late into the devouring of the banana pudding, but I went ahead and snapped a photo of it anyway. There are Paleo versions out there but I kept it simple and original this time (my first time to make it) since I am the only one that really restricts myself to Paleo anyway. I did try it and it was TOO good. The point of #6 is not the pudding though! It's the weekend with the BF, our families, and friends. The weather was cold but sunny, the fireplace was lit, the food was tasty, and the conversations and hugs were long overdue. My heart is full. How was your past week and weekend? Did you do anything fun for Halloween and dress up? What are the highlights from your week? Comment below!